Status: offline 60 year old female fell down a couple of stairs and slammed her right shoulder into a wall. She complains of right shoulder weakness and pain over superior portion of the shoulder. She is unable to abduct her shoulder. Positive drop arm. What are the findings? Status: offline I have some diffculty looking at these on the monitor. The AC joint looks goofy to me. And then in that bottom picture, it is quite bright and more white than anything else, but what's that glob like thing at the lateral end of the spine of the scapula (it's actually in both views but my eyes notice it more in the bottom one)? I'm not sure if the humeral head is in the right position either in that bottom view. Status: offline Alex, welcome back. It looks like a fracture of the lateral acromial process. On the top view the lateral humeral head looks a bit moth eaten but not on the bottom view. 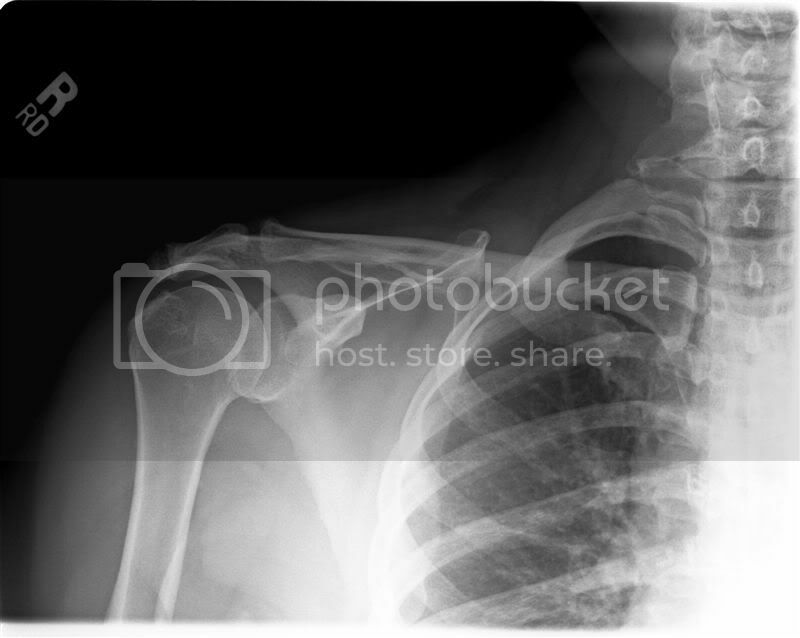 The end of the clavicle looks a bit odd too but this may be the angle of the view. Status: offline Welcome back Alex. 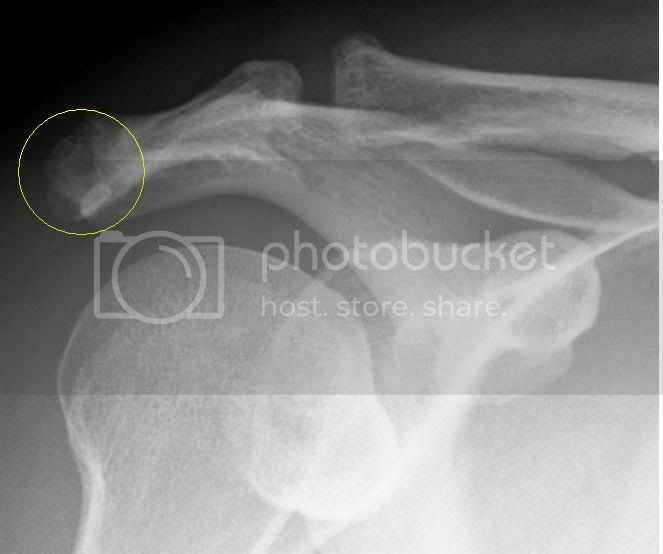 See a fracture of the distal 1/3 of the acromion. The white brightness may be the edema in the area. Looks like the humerus is not within the glenoid fossa and dislocated to some degree? Status: offline i agree with the theory of distal acromion fracture. possible AC seperation as well? also, the medial border of the scapula seems to be "riding high" to where it looks like it rests in a position higher than the clavicle. this downward rotation of the scapula might be the cause of her being unable to abduct her arm. just my rookie opinion. Status: offline Could there be an Os Acromiale? Status: offline How long ago was the fall? How long before the x-rays were shot was the fall? Status: offline Jeep, one week. 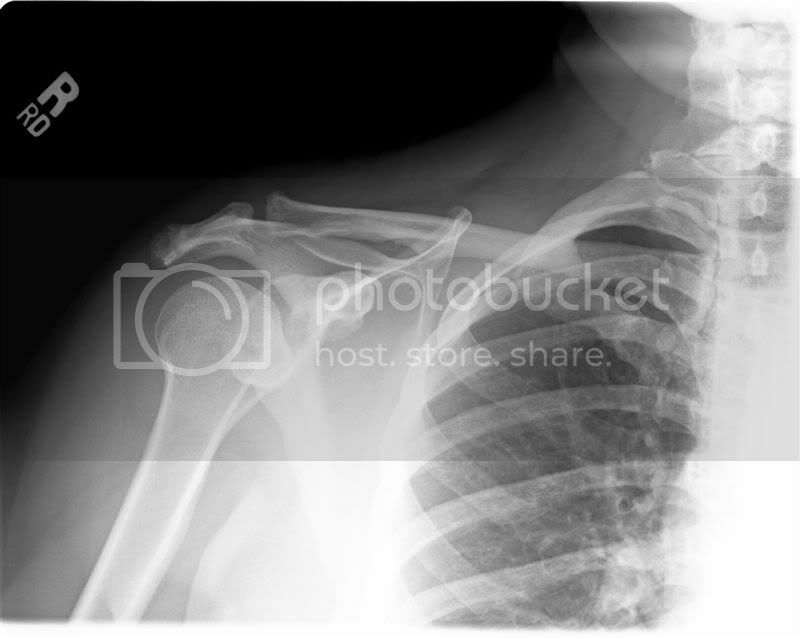 Status: offline I'm thinking- beginning of callous formation at clavicle(inferior border) and humeral head. small fracture line just inferior to humeral head(#1). Acromion fracture. Status: offline Well, good news is I don't see a fracture of her proximal humerus. I'm not sure if her acromion is an os acromiale or a fracture, on the second view it appears to have a more rounded edge. I do see the dysplastic appearance of the clavicle that Jeep mentions, so not sure what to think of that. I think rotator cuff tear is the most likely culprit. Not much osteopenia for a 60 year old. She might be rather fit! Status: offline Alex, hope you're back on your feet. Looks like a fracture of the acromion and possibly an avulsion fx of the coracoacromial ligament off the acromion. Also, the soft tissue lateral to the shoulder looks flattened, probably from a deltoid tear (or just that the posterior & middle deltoid is no longer attached to a stable bone & looks torn). There could be a rotator cuff tear, but with this injury and associated pain a drop arm test could be positive without a rotator cuff tear. Status: offline FINDINGS: Internal and external rotation views of the right shoulder were obtained. There is an unfused secondary ossification center with well corticated margins along the lateral-most aspect of the right acromion. This most likely represents an Os Acromiale and not a fracture. 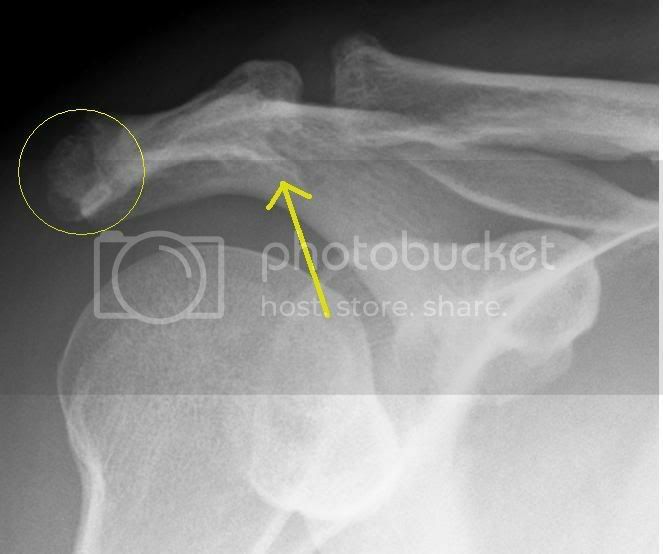 There is a 5 mm defect in the acromion at the acromioclavicular joint which appears to have smoothly corticated margins. No other osseous abnormalities are noted. IMPRESSION: Unfused secondary ossification center along the lateral-most aspect of the acromion. 5 mm smoothly corticated defect of the acromion along the acromioclavicular joint may represent a developmental variant or erosive change (though no other definite acromioclavicular degenerative changes are seen). This patient clinically has a full thickness rotator cuff tear. Interestingly, the presence of an Os Acromiale is associated with an increased incidence of impingement and rotator cuff tears. Status: offline Thanks for posting the findings. How are you fairing these days? Status: offline Nice job Steve. Two and a half weeks out from ACL reconstruction. Doing well, pain is minimal and is mostly over the Pes Anserine where they took my HS tendons. Motion and function right on with the protocol I am following. I cant wait to start swinging the bat. Thanks for asking. Status: offline The Os Acromiale would be better visualized with an axillary view or a Skyler notch view which were not taken. Although the radiologist did not mention it, I think there is some erosion on the greater tubercle as seen in the first image above. These are probably age related. She has had a long history of shoulder pain and I would not be surprised that she has had a degenerative tear that was just torn all the way through with the trauma. She will be seeing ortho surgery in a few weeks for evaluation. I am not sure if they would repair it. In civilian practice do surgeons typically repair full thickness tears in elderly patients or do they let them go and send them to rehab? In the military, I have found that the surgeons are pretty conservative and don't repair these. Again, not mentioned by the radiologist but does this look like a big spur to anyone else? Status: offline Now that you point it out, it sure looks that way. Why do you or anyone think that this was not mentioned in the first place? I am not sure the outlet view would be worthwhile to the Orthopedist in making a surgical vs conservative management call.